Meat played a key role in cookery in the 11th-15th century. There was a wide range of dishes made especially for the rich and nobles and in a typical lord of the manor’s kitchen (which you would find in most medieval castles) there was provision for spit roasting and broiling of meats on a suprisingly large scale. Feasts and banquets often required many types of meat to be roasted and the castle kitchen had to be able to cope with this demand. There was enormous variety of methods for the preparation and presentation of meat dishes and this reflected to class structure of the day. There were simple recipes as cooked by peasants who had limited access to meat and little space in which to cook it to incredibly elaborate recipes cooked by teams of people in the medieval castle kitchens of the rich and powerful. Blawmanger was a common meat recipe using rice and minced chicken. Ground almonds were sometimes added. Simple but staple. The modern blancmange popular in the UK is a type of dessert, which only bears a slight similarity to its historic forerunner. Broiled Venison was a dish reserved for the rich and a popular meat recipe at medieval banquets and feasts. 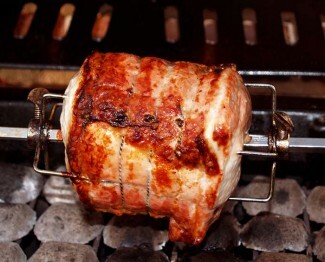 Essentially, the meat was scored or parboiled and then larded before being spit roasted. A basting sauce of red wine and ground ginger, poured over the meat as it roasted on the spit added extra flavour and richness. Pork Roast with spiced wine basting was a similar type of dish. The basting sauce’s ingredients were red wine and spices such as garlic and ground coriander. 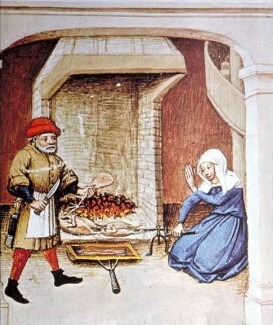 Pork was often treated in the same way. Read more about herbs in medieval cookery. The subject of medieval meat recipes is vast because of the different types of meat and combinations of herbs, spices and wine that give them such character. You can try a medieval-style recipe yourself with this one – it makes a great beef & red wine stew. This is a good example of what was probably once a poor 12th century Englishman’s meal where the beef had to be tenderized to make it palatable using wine but over the centuries the recipe has been refined, become more popular and is now much more in the class of haute cuisine (like its French counterpart beef bourguignon). It is one of those dishes that is ideal for cold winter days when you want to serve something ‘home-cooked’ and appetizing for dinner. Something special to look forward to.